DISCOVER THE PARADISE OF THE ENDURIST IN SOUTHERN PORUGAL! 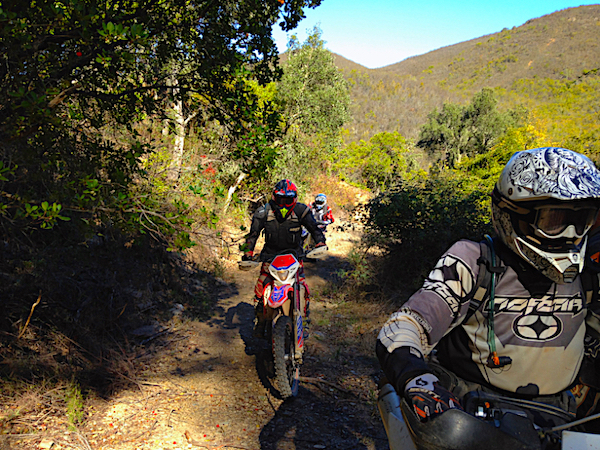 The beautiful trails of southern Portugal will make you discover the extreme south of the Iberian Peninsula. Between plains and hills, rolling and winding, hard and sandy, the variety of terrains and landscapes will enchant you. Always very welcome in the hotels *** and the charming guest houses of our selection, you will taste the excellent local gastronomy. 5 guided riding days / 5 nights half board + 1 night with breakfast on departure / arrival from LISBON (Grandola). About 900 km (minimum 95% off-road). Quality hotel **, *** and guest house. Suitable for experienced off-road riders. november 24 - 1 dec.
DAY 1. Arrival in Lisbon. Group transfer from Lisbon airport to our base in Grandola. Briefing. Dinner and overnight at the beautiful guest house with swimming pool in the middle of the cork oaks. DAY 2. 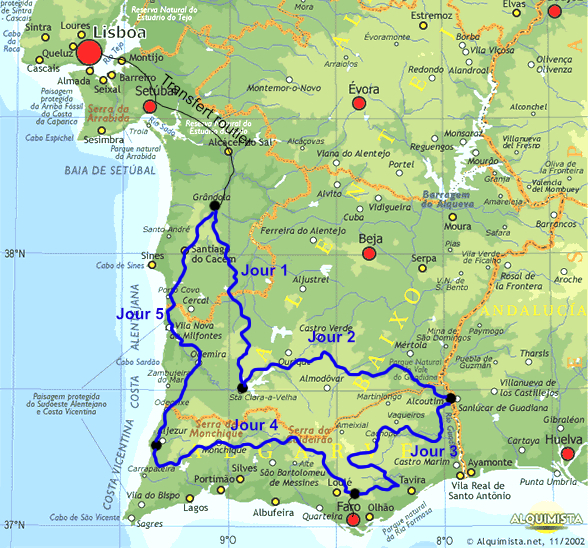 Grandola - Santa Clara (190 km) We will begin our journey in Alentejo in pine forests, then take the Serra de Grandola with some trails in the middle of the cork oaks. Lunch break towards the Monte da Rocha dam. The afternoon will be more mountainous since we will arrive in the Algarve massif. We will reach the shores of the dam of Santa Clara where is located charming traditional guest house with swimming pool. DAY 3. Santa Clara - Alcoutim (220 km) Big step in the program, with almost the crossing from west to east of the mountains of the Algarve. We will gain through beautiful technical paths the central areas alternating maquis and forests. Lunch break to Almodovar. We will end this beautiful day along the shores of the Guadiana border with Spain. Dinner and overnight in guest house with swimming pool. DAY 4. Alcoutim - Sao Bras de Alportel (180 km). Shorter and more technical step. We leave Alcoutim by hilly tracks between olive trees before reaching the banks of Rio Guadania. Lunch at Barranco Do Vehlo. In the afternoon we will ride exclusively in this paradise of off-road, sometimes on the tracks of crests, sometimes in the valleys. We will spend the evening and the night in hotel *** with swimming pool in Sao Bras de Alportel. DAY 5. Sao Bras de Alportel - Aljezur (200 km). A delightful stage with tracks and paths that will delight us with splendid landscapes of the mountainous massif of Serra de Caldeirao. This most technical day will take us to the south of Serra de Monchique where we will have lunch, then descend to the Atlantic coast where the multiple paths offer splendid landscapes. End of stage close to Aljezur, hotel *** with swimming pool. DAY 6. Aljezur - Grandola (210 km). Last step we will go up the entire Atlantic coast from south to north. We'll see the wild coast Vicentina and its magnificent cliffs. In the middle of the day, we will take a break in the coastal village of Vila Nova de Milfontes. The Alentejana coast for the afternoon with sandy slopes and some technical passages. Before closing the loop, the last pleasures of driving on beautiful tracks silted in the pine forests. Overnight at the guest house in Grandola or a hotel *** in Lisbon according to the organization of each. Dinner free.